The Burke-Gilman Trail is directly across Bothell Way from the Market. Here‘s a Metro Bicycling Guidemap. 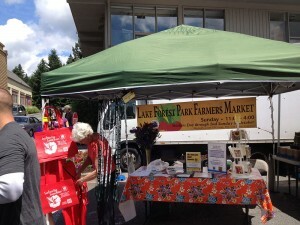 The market is at the intersection of SR522 and Hwy104. 1. Take Bothell/Seattle (Exit 23) and enter Bothell. 2. Follow signs marked Seattle. 3. Continue straight ahead through Kenmore and into Lake Forest Park. 4. Take the first right turn past Ballinger Way, and enter the parking lot. 1. Take Lake Forest Park/Ballinger Way exit (Exit 177). 2. Take a right and follow road 2 miles until you reach the Town Center at Lake Forest Park on the right. Enter at the light on 175th. The market is on the lower level, in front of the Professional building. You can park on either level. 2. Take a left and follow road 2 miles until you reach the Town Center at Lake Forest Park on the right. Enter at the light on 175th. The market is on the lower level, in front of the Professional building. You can park on either level.